In 1955, West Germany banned women's soccer, citing concerns over injuries to "body and soul" and "propriety and decency." Since lifting the ban 15 years later, however, few countries have moved as decisively to put women's soccer onto grand stages, with a federation determined to grow the game all the way from schoolyards to World Cup stadiums. The results speak for themselves: two World Cup titles, seven European championships and a massive fan base. "When I was a player, we had 1,000 or 2,000 people [at a game]," said Maren Meinert, a cornerstone of the 2003 World Cup champion team. "Now we have 15 [thousand] or 20,000 people." Or more: Some big games in 2009 drew more than 20,000, highlighted by a crowd of 44,825 for a 1-1 draw with Brazil in Frankfurt. That wasn't for a World Cup game. That was a friendly. The same year, 28,367 fans watched the visiting USA win a 1-0 decision. For comparison's sake, the biggest crowd the U.S. women's team drew at home in 2009 and 2010 was 10,321, versus Germany in Cleveland. And more than 24,000 fans turned up to see the final of last year's Under-20 Women's World Cup, in which Meinert coached the hosts to victory. The turning point came 20 years earlier, when a pre-unification West Germany team shook off disappointment in the first two official European championships, then won at home in 1989 in front of a large crowd and a TV audience. Meinert recalls being inspired by players such as Silvia Neid and Doris Fitschen. "That was the first time I started to think I wanted to be like these girls on TV," Meinert said. The newly unified Germany kept up the continental success in the '90s, winning three of four European championships. Yet Norway twice thwarted Germany on the world stage, winning the World Cup final in 1995, and winning a group-stage game that kept Germany from advancing in the 1996 Olympics. The other '90s nemesis was the USA, which romped to a 5-2 win in the 1991 World Cup semifinals. But it was in a 1999 quarterfinal that Germany showed that the gap was closing, twice taking a one-goal lead before falling 2-3 in a World Cup classic. "They had great men's football, and their players learned a lot from watching that and seeing it on a regular basis," said Brandi Chastain, who scored for and against the USA in that game. "They're not Brazilians. They're very organized, they move as a unit very well. A little mechanical at times, but effective." The German tipping point came four years later. With the tournament once again taking place in the U.S., Germany beat the hosts in the semifinals, getting an early goal and withstanding a relentless but unimaginative American attack before punctuating the win with two late counterattacking goals. The final pulled a TV audience of 12 million in Germany. With an extra-time win over Sweden, Germany at last had its women's world title. And Germany made sure the momentum wasn't lost. "Of course, success is important, though success without a concept it behind doesn't bring much," said Steffi Jones, a former defender and now president of the 2011 World Cup organizing committee. "The German Football Association is fully committed towards women's football, and our FA president, Dr. Theo Zwanziger, is a fervent promoter of the game, which has enabled us to increase the popularity of women's football in Germany." That includes the grass-roots efforts that have put soccer into schools and expanded the number of women's teams to more than 6,000. Germany now counts more than a million registered women's soccer players. At the top of the pyramid, players compete in a well-established league, the Frauen-Bundesliga. Competition is fierce for the title and for spots in the Champions League. In this year's competition, Turbine Potsdam and Duisburg squared off in an all-German semifinal. Though the Frauen-Bundesliga includes a handful of foreign players such as U.S. defender Ali Krieger and Japanese forward Yuki Nagasato, whose goal put Potsdam in the Champions League final, it also kicks up the competition for places on the national team. "They get more people to have an opportunity to come in and out of camp, not necessarily the same people all the time," said American Gina Lewandowski, who played four years at FFC Frankfurt before moving to the Western New York Flash of Women's Professional Soccer this spring. "If one player's doing well, the coach will call up a player who hasn't been in the pool as give her a shot." The established stars also get plenty of time in the public eye. Lewandowski has seen Birgit Prinz and other national team players in commercials, and marketing and advertising has been on the upswing with the World Cup drawing near. "Players are getting opportunities for endorsements and commercials as more and more companies have identified women's football as a niche," Jones said. Not that players, with the possible exception of long-standing elite competitor Prinz, are being singled out. "In my view, other German athletes, such as [biathlete] Kati Wilhelm or [Alpine skier] Maria Riesch are more famous than the soccer ladies," said Torsten Kuehn, a German native who lives in Esslingen. "It probably is down to the fact that individual athletes get more media attention when they are successful. Even former stars like [tennis player] Steffi Graf or [figure skater] Katarina Witt seem to be more present than the actual football team. Single team members will be interviewed, but have consequently less time 'on air' per person." But taken as a whole, the team and the sport are getting plenty of attention. "We were able to sell out our [World Cup] sponsorship program one and a half years before kickoff," Jones said. A World Cup on home soil won't hurt the momentum either. "I wonder if these young players have any idea how awesome this World Cup is going to be," Chastain said. "I think it's going to be the first of its kind. It's strictly soccer stadiums." And Germany's young players have grown up with the game and its stars. "After games, you see most of the girls going up to the national team players and calling their names for autographs," Lewandowski said. And just as Meinert was inspired 20 years ago by Neid and Fitschen, her generation is inspiring thousands of young players today. 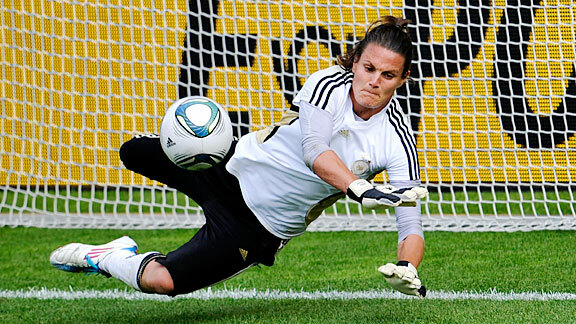 "If you would [have] asked girls 10 years ago, they would say 'I want to be like Oliver Kahn,'" Meinert said. "Now they say they want to be like Nadine Angerer."